Do not suffer in work at the hands of someone else and their questionable behaviour. It is everyone’s right to go to work and do their job without interference or an intolerable attitude of someone else so take a stand now and speak to your manager if you feel that you are in such a situation. Most often though, your manager might not be needed and you can handle your beef yourself. Here are some examples of difficult work personalities and how you can handle them. 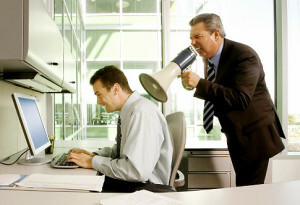 The boss is the employee who is just plain bossy but actually isn’t your manager. There is at least one of these creatures inhabiting every office across Australia and they are probably the easiest of the personalities to tackle. Tactically, your best bet is to ignore the boss. It is really the only way that they will back off if they realise that you are not taking them seriously. Otherwise, if they persist, call in your manager to have a word. They will sure know how to show them who calls the shots. The sneak is an enigma; difficult to oust because of their sneakiness. The sneak engages in behaviour such as taking credit for your work, blaming you for their mistakes and sucking up the boss. They often get away with their behaviour because they wear a very believable mask on front of management and those higher up the executive scale. They will step on you in an instant and will do anything to climb the corporate ladder. What is so frustrating about this type of work colleague is that it can appear to be your word against theirs; such is their air of credibility. The most effective way to manage this type of behaviour is to call the culprit out on it. If they have stolen credit for your work make sure you voice this. It is always advisable to keep bitchiness out of an office but do not be afraid to speak out. We all know one; the type that spends their evening peeking around their curtains into the neighbours lounge across the road. They want to know everything about you; what you ate for breakfast, what your dogs name is, why you last went to the doctor. Work and our personal lives sometimes have the lines blurred but some people like to keep those lines extremely clear. If you do not want to disclose your information, then simply don’t. If you do not feel comfortable telling someone to mind their own business, try making up something for kicks. I had chicken curry for breakfast, my dogs name is Roger and last time I went to the doctor was for explosive diarrhea. Watch how quick the nosy neighbour loses interest in you. This is the scary one. The clinger wants more than work camaraderie; they want a fully blown friendship that involves phone calls at the weekend and cinema visits in the evenings. Sure, it is possible to make great friends at work but it is also possible to meet some really intense slightly creepy people that we want to remain in our office lives only. Thread carefully with the clinger. Never lie about having plans; if she/he spots you in Woollies buying ice cream and Pringles on a Saturday night when you said you were busy you are in a whole lot of hot water. It is probably better to be transparent on this one and let them know that work and play unfortunately doesn’t mix. It might be brutal but it saves hurting their feelings in the long run.